I don’t really count myself as a horse racing fan, per se, but what I AM a fan of is dressing up, having cocktails, being outside, and people watching. 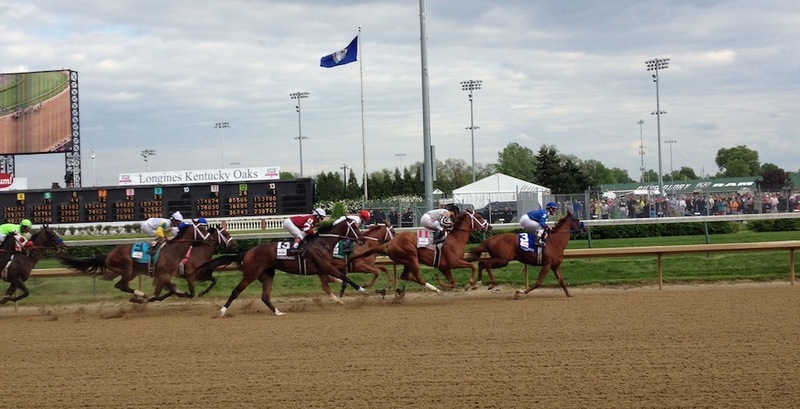 The weekend of the Kentucky Derby and the Kentucky Oaks contains all these things, and is really something to behold. Many people don’t know this, but the day before the Derby there is a full schedule of races, culminating in the day’s main event, the Oaks. Since it’s less well known than the Derby, there are fewer people – and thanks to an amazing friend, we were able to get front row clubhouse tickets. It ruined me for life. THAT is how you watch a horse race my friend. Pretty much from the moment we walked in I vowed to go back to the Oaks next year. The weather was a little chilly for my taste, but the hats, outfits, and beautiful horses did not disappoint. Saturday, of course, is Derby day. Because it’s all general admission, we had to arrive quite early to stake out our plot of infield in good view of the track. It was fun enjoying the sunshine and watching the infield fill up with all manner of people ready to party. Much different from last year’s interminable rainstorm. (Fun in its own way!) And after another full day of fresh air and exciting races, we were well worn out. The weekend was amazing. Very tiring, but amazing. That’s my horse in last place. Capturing the five minutes of sunshine. At the paddock for the Oaks. Can you photobomb a horse?